Currently viewing the category: "Japanese Language Learning Resources"
All of these books are available for free online, once you’ve signed up for EhonNavi. Click here for my EhonNavi registration walkthrough. To read the book, find the orange button marked 全ページためしよみする, but be aware you can only read the book once and EhonNavi is rather buggy, or maybe just picky; they recommend IE or Firefox on Windows. They’re sorted by word count, because not all picture books are the same difficulty, and in my experience it’s the quickest way to find out how hard the book really is. In the interest of not taking forever to catalog them, I just have the name translation and word count. I’ve added a ♬ next to books I think have some cultural content. This is pretty subjective, of course. I’ve added a ❤ next to books I particularly liked. At the moment, Kokoro no Ehon is my favorite site for basic Japanese reading material. It’s a collection of original kids’ stories, most between 150 and 350 words, which makes them the equivalent of fairly basic picture books. Considering that you might pay between $5 – $20 for a real picture book with just as many words and pictures, this is a great find! There are other story collections online, but this one distinguishes itself by the pictures (which are helpful for learners, not just for decoration) and by the fact that these are all new stories, so you’re spared from yet another version of 桃太郎. If you’re new to extensive reading, even if you’re not new to studying Japanese, try some of these stories! the title. There are 24 stories listed here, for a total of 270 pages and 5,464 words. With over 1,000 free Japanese picture books, EhonNavi is like living next to a library! Sign up here, it’s quick and free. (I wrote a walkthrough to help with this part.) Once you’re logged in, click the link on the right that says 全ページ試し読み to see the available books; click a book and find the yellow icon that says the same thing to read it. There are books for everyone here! The list of available books has a section where they can be sorted by age. I’ve also started sorting them by word count. The lower the word count, the easier the book. I’ve mostly focused on adding the very easy ones so far, so that even beginners can start reading. You can only read a book once, and if there’s an error of some sort you should be able to re-access the book, as long as it’s within 15 minutes. The recommended OS is Microsoft Windows XP Home Service Pack 3, with Internet Explorer 8.0 or Firefox 3.6 and Flash Player 10 installed. It may not work as well with WindowsXP Service Pack 2 or Mac, and Chrome is not supported. I read them on a Mac with Firefox, and it works consistently for me, but I have to follow a procedure. When I open the book, the first thing I do is flip through the pages, waiting until each one loads. Once I’m at the end with all of the pages loaded, I’ll go back to the beginning and read. If the loading stops and some of the pages are still pixelated after waiting a few minutes, I have to shut the whole browser down, then open it back up again and start reading again. (Just closing the window with the book in it and trying to open that again never works for me.) Hopefully it’s not like this for everyone… Remember, you have a 15-minute window to load the pages, but once you have them loaded you can keep the window open indefinitely. It’s a little picky, but I think this is the best resource out there for Japanese picture books, so please give it a shot! デジタル絵本サイト (Digital Picture Book Site). This site has around a hundred picture books, all illustrated by children. My only problem with it is that there are a lot of compression artifacts around the text for most, though not all, of the stories, and it really bothers me, considering that actual kids books start with nice, clear, large text. If the poor quality of the text is a problem for you, start with the stories in large text — there’s about thirty of them. A collection of reading material, sorted by level. There’s various types of material available: stories, articles and so on. It seems to be geared towards a more traditional type of reading practice, with no pictures and long wordlists. I would recommend the other story sites over this one because it might be too tempting to rely on the English translation; there are, however, many Japanese fairy tales available here, and my impression is that they use more advanced kanji than the other two sites, so it may be worth a look. There are only a handful of stories in Japanese, but I do like to see kids’ books from the Showa era, so I’m including it anyway. 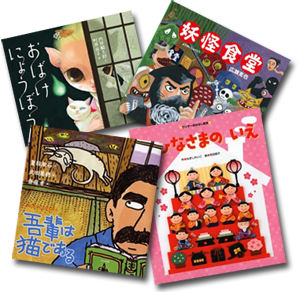 Gakken has made some of their books available for free in PDF form to help support the children and families still living in shelters after the 2011 Tōhoku earthquake and tsunami, as well as volunteers and nurses. The page is divided into three categories: picture books/reading material, games that can be played without special equipment and disaster nursing. This is, unfortunately, just one story, but if you are thinking about buying the よむよむ文庫 Japanese graded readers (or of course, just for reading practice in general), try this Level 1 (beginner) story, which was put up as a sample of the series. More of a listening resource than a reading resource, but that’s good to have too! Each story has a link to its corresponding Aozora entry, so you can read along while listening if you like, or read the story first if you prefer. (This may also be a good way of finding more reading material by the same authors on Aozora, which I think is a hard site for a beginning reader to find suitable content on.) Stories with a green button marked 立ち読みする have lovely illustrations and text to go along with the audio. These are generally more complicated than stories from Hukumusume or the Digital Picture Book Site. This used to be available as a podcast, but I can’t tell if it is anymore or not. It’s a mother and her son reading stories from different sources such as Aozora and 福娘童話集, and it’s really charming! There are links to all the stories, so you can read along. Aoitori Bunko is a line of classic books and original fiction aimed at children between around 3rd grade and 6th grade; I would estimate most of their books are level 6 or so. This page has previews of dozens of their books, so check it out if you are a fairly advanced reader and looking for a new book or series to try! The Magic Tree House series has been translated into Japanese, and you can read around a dozen pages from each of the books here, so you can test them out and see if they’d be at your level and fun for you. I don’t know about the rest of you, but I find 擬音語 (sound words) and 擬態語, (emotional state words) to be extremely hard to learn just from context, so one of my friends was kind enough to find this site for me. It presents those kinds of words in context and in comics. Aozora is similar to Project Gutenberg, with impressive amounts of public domain material freely available. As far as extensive reading goes, though, I think it’s really only likely to be of use to someone already reading at a fairly high level (level 5 and up by my classification system), and they use the ruby tag for furigana, which displays kanji readings in parentheses if you’re using a browser that doesn’t support the tag. (Chrome, Safari and Internet Explorer support it.) If you’re not yet at the level where you can read advanced material without decoding it, I think even the time spent trying to navigate this site to find something interesting and suitable to read would be better spent elsewhere. Still, if you can handle advanced material without decoding, it might be time to try some authentic literature here. You could start with 宮沢賢治 (Miyazawa Kenji), who wrote children’s stories such as 注文の多い料理店 (The Restaurant of Many Orders), or 新美南吉 (Niimi Nankichi), whose 手袋を買いに (Buying Mittens) is a classic. I suspect there is fun to be had here if you are not only a fairly high-level reader, but also patient with the interface and able to cope with unexpected things like old-style kanji and orthography and horizontal Japanese read right to left. There’s Japanese kids’ books in the 909 section (use the テーマ検索 link to get there), you could search for stories you already know like 桃太郎, or start with this page about children’s stories, from the announcement of the merging of the 児童書デジタルライブラリー (Juvenile Literature Digital Library) with this site. I can’t say I’m seriously recommending this for most extensive readers, even if there are children’s books — I just think it’s so amazing that something like this is available to the world. News written in easy Japanese. Of the news sites I’m listing here, this one is the simplest. The language is simplified and there’s a pop-up dictionary for words that a reader might not know. Plus, there’s audio to go along with it, you can make any place names or names of people show up in a different color and you can follow a link back to the original article if you want to challenge yourself a little more. I wouldn’t recommend any of these to a beginning reader, but if you’re an intermediate reader and you want to start reading the news, start here! News articles written for grade-schoolers and middle-schoolers from the Asahi Shimbun’s sister paper, こどもアサヒ. There’s also a digital version of the full newspaper that you can subscribe to for 1720 yen a month. If anyone actually does this, please tell me how you liked it! 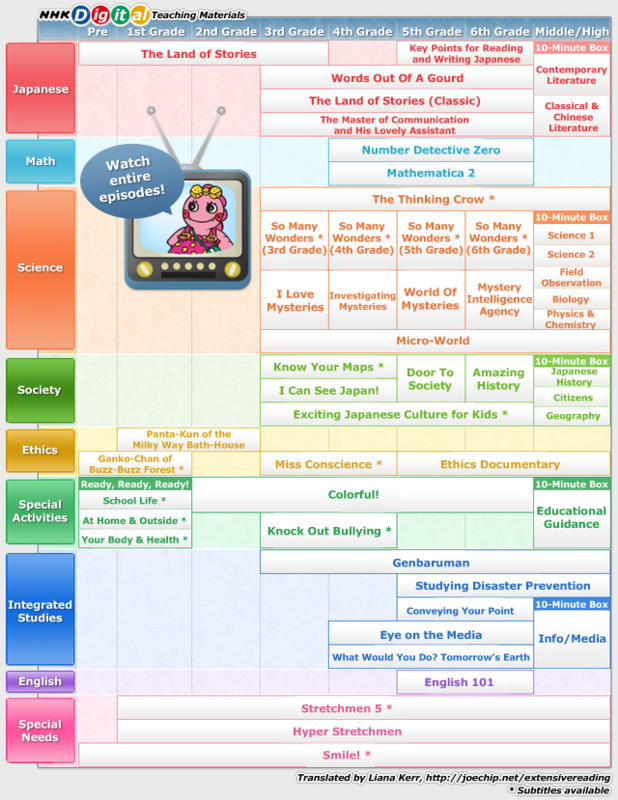 Articles and so on for grade schoolers from the Mainichi Shinbun. I haven’t spent much time reading this one, but the sense I get from it is that it uses harder language and fewer supports than NHK News Web Easy, and that there’s more types of content, such as interviews and explanations of words used in the news. I’m always on the lookout for more online reading resources, so feel free to post them in the comments! I’m particularly interested in low-level resources, because those are the kinds of things that are the most useful, but the most hard to find if you’re a beginning reader. I presume that anyone who is able to read things like the texts at the Japanese Text Initiative already knows how to find them. Of course, I was most impressed with the Seattle library system’s Japanese language selection. We ended up moving to Tacoma, but it’s been in the back of my mind ever since that a Seattle library card could be mine for around $80. After all, there are more than 600 Japanese children’s books spread out between the various branches — that puts the 125 children’s books held at the Tacoma library main branch (no direct link, but you can search for JAJ) to shame. I just love any excuse to take the train up to Seattle, so getting there every so often wouldn’t be a problem… I was going back to look at exactly how much a prized Seattle library card would set me back ($85 per year, incidentally) and I saw something that hadn’t registered when I looked at that same page back when I lived in Ann Arbor: the Seattle public library has reciprocal arrangements with various other libraries in the area. Tacoma’s not one of them, but Pierce County is, and as it so happens, Tacoma and Pierce County have their own reciprocal system, where someone living in Tacoma can get a Pierce County card and vice versa. So the question was this: are library cards transitive? I’ve never before in my life felt the need to have three separate library cards, but that was before I started running out of appropriate books. The day I suspected that this might be possible, I went out and got a Pierce County card — just in case. As it turns out, even though I’m from Tacoma, that Pierce County card and a valid picture ID with my current address qualified me for a Seattle library card after all! I called ahead to ask, then took the train up to Seattle the very next day. I returned home with 26 books♪ I had been to the main library before and had been duly impressed by the rows of Japanese children’s books, but I didn’t truly appreciate their value until I started extensive reading and had to start looking not just for any old book, but for books at a certain level. If you happen to be in Washington State, take a moment to see if you qualify for a Seattle library card. For an extensive reader, it’s worth the trip. If not, are there any major libraries — public or part of a university or college — in your area with some Japanese books that you might be able to get access to? Hopefully, this may be a possible path to gathering more resources for other extensive readers as well. Incidentally, the Pierce County library system has enough Japanese books to have made it worthwhile for me to pick up a library card in its own right. My parents live in Pierce County, and when we stayed with them for two weeks after moving while figuring out where we wanted to live, I borrowed my dad’s card to check out a couple of books. (He handed it over, and then, with some embarrassment, handed over a $20 to pay his fine. So that’s where I get it from, I thought. It hasn’t escaped my notice that getting books from three different libraries opens me up to three times the potential library fines…) Actually, a shiny new library in University Place, which is part of the Pierce County system and about 20 minutes away from me, opened in February. Had it been open when we moved to Washington, that might have bumped University Place up a few notches in my potential destination calculations! By the way, the reason I divide my book reviews not just by level, but by library, is that I hope to be extra useful to other readers in the area and perhaps even to put together an extensive reading group at some point. I should have started that already, but to be honest I’m extremely shy. If you’re in the area and interested in something like that, feel free to e-mail me and maybe that will help me become more motivated!